More than two thirds of emerging infectious diseases (EIDs) have their origin in animals. Examples of Zoonotic diseases or zoonoses (diseases transmitted between animals and humans) include Zika, Ebola, avian flu, SARS, MERS, West Nile Virus, Lyme disease, and yellow fever. Many common foodborne infections caused by Salmonella, E coli, and Campylobacter and other pathogens have their origin in animals and are a major cause of disease globally. Zoonotic Disease Clinical Services at University of Washington: The UW Medical Center Infectious Disease and Tropical Medicine Clinic has started a new Zoonotic Disease consultation service to provide specialized evaluations for patients with suspected zoonotic disease. There is growing evidence that the trillions of bacteria and other microbes living on and in our bodies (the human “microbiome”) play an important role in human health and disease. Recent research, including at UW COHR, indicates that our microbiome can be affected both by our environment and contact with the microbiome of animals that live in and near our houses. We know that the microbiome of children living in households with pets is different from that of children living without pets, and that children with pet exposure may have lower rates of allergy and asthma. Understanding these microbiome interactions could be crucial to healthy coexistence between humans, animals, and their shared environments. Leptospirosis, caused by a spirochete bacteria, is one of the most common worldwide zoonotic diseases, and can cause severe illness. UW COHR is studying risk factors for Leptospirosis in communities living on the Amazon river with close contact with animals. Brucella is a bacterial infection of livestock and other animals that can be zoonotic and cause severe and long lasting disease in humans. UW COHR is collaborating with the Greninger lab at UW and the Ben Gurion University in Beer Sheva Israel on research using whole genome sequencing to help develop better diagnostic, treatment and prevention approaches for human Brucellosis. The United Nations and the White House have declared that the growing problem of bacteria resistant to antibiotics (antimicrobial resistance or AMR) is a major threat to global health. To address this threat, these institutions have called for a One Health approach to reducing inappropriate use of antibiotics in both humans and animals, and monitoring trends in antibiotic resistance in humans, animals, and the environment. UW COHR is working with partners across Washington State on the Washington Integrated Surveillance for Antibiotic Resistance (WISAR) database, that is bringing together local AMR data from humans, animals, and environmental samples. The WISAR project with support from UW COHR as well as the WA Department of Health and CDC, is providing data to inform a statewide plan on One Health antibiotic stewardship. Many parasitic diseases of humans are zoonotic (transmitted between animals and humans). UW COHR is studying populations with close animal contact in countries such as Peru and Thailand to determine the extent of transmission of parasites and help define strategies to reduce human infection. The Global Assessment of Zoonotic and Environmental Risks (GAZER) is a study of humans in close contact with animals and their shared environment. The study aims to look at determinants of healthy coexistence between human and animal populations, including sharing of “microbiomes” betweeh humans, animals, and the environment, and to gain greater understanding of how to balance the risks and benefits of animal contact. Currently we are piloting the GAZER study concept in Thailand, Peru, and with Dairy workers in Washington State. Animal workers, including those engaged in veterinary medical care, laboratory research, farms, and zoos, are at increased risk for job related injury and illness. UW COHR is pioneering efforts to improve occupational health and safety services for animal workers in a variety of settings. The UW COHR work uses a One Health model for animal worker occupational health that stresses healthy workers and healthy animals in a healthy and safe work environment. Veterinary workers do many of the same tasks as workers in human health care. Such workers experience high rates of work related injury and illness, including animals bites and scratches, allergy, and zoonotic infectious diseases. At the same time, they may have little access to occupational health services. The Healthy Veterinary Worker study seeks to identify key health and safety risks in veterinary workplaces in order to develop strategies for ongoing prevention and early detection of problems. With support from the Washington Medical Aid and Accident Fund (MAAF), UW COHR has begun a Washington Animal Worker Health Initiative (WAWHI), to raise awareness and increase knowledge regarding occupational health and safety risks for animal workers in Washington State. Recent support from MAAF has also led to the creation of the Healthy Animal Worker Clinic (HAWC) at Harborview Medical Center. Growing up on a farm has been associated with lower rates of allergy and asthma, a phenomenon known as the “Farm Effect”, or the “Hygiene hypothesis”. The Healthy Dairy Worker study is a study of dairy workers in Washington State. The study seeks to determine whether working on a dairy farm has a beneficial effect on the microbiome of workers. Lessons learned from this study may be applied in the future to better make use of the health benefits of microbiome diversity. Worldwide, populations of humans and animals are increasing, and there is a growing need to define better approaches to healthy coexistence between human and animal populations on local, regional, national, and international scales. UW COHR is carrying out a number of projects to compare health indices between humans animals and environments they share. Persons experiencing homelessness and their pets both need medical care, yet many homeless persons with pets face barriers to accessing preventive medical services. These companion animals are often providing important psychosocial and/or physical support for their owners, and the strength of their bond with their pet often means owners are more motivated to seek care for their animals than for themselves. UW COHR is carrying out community based research with people experiencing homelessness with their animals in Seattle, funded by the UW Population Health Initiative. UW COHR, in collaboration with the University District Street Medicine student group, Neighborcare Clinics, and the Washington State University college of Veterinary Medicine, is initiating an innovative model for a pilot “One Health” clinic where the homeless of Seattle could seek care for both themselves as well as their pets. Due to their increased exposure and often increased susceptibility, many animals, like the “canary in the coal mine” may be more likely than humans to become sickened from health threats in the environment including chemical, biological and physical hazards. By paying more attention to these “animal sentinels”, humans may be able to more rapidly detect and prevent environmentally induced disease. Such efforts could also lead to healthier environments for both people and animals. Human and Animal Sentinels of Natural Gas Extraction Activities (Hydrofracking): The Center for One Health Research has done extensive research in Southwest Pennsylvania to investigate the health effects of fracking on those living in the area. Read our paper published in Environmental Health Perspectives. Better integration of disease surveillance between humans and animals could lead to better detection of health threats from infectious, chemical, and physical hazards. UW COHR is working with the Washington State Department of Health and the Washington State Department of Agriculture on integration of disease reporting between human and animal health. 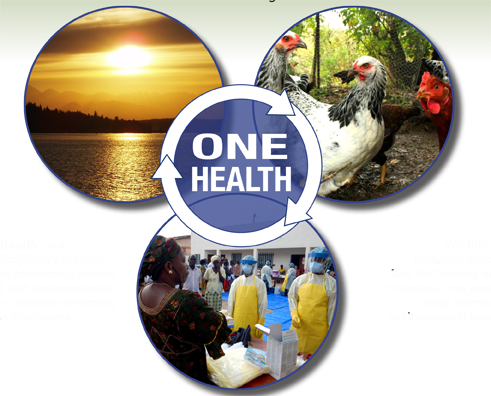 The One Health concept stresses the need to maximize health for humans, animals, and the environment on which both depend. On the local level, this may mean better detection of diseases in individual humans and animals, and controlling local environmental health hazards. To be truly sustainable, such efforts at improving environmental health for humans and animals need to consider the planetary scale of threats such as global green house gas production, threatened food supplies, water scarcity, air pollution, and decreased biodiversity. By creating sustainable local models of coexistence between human and animal populations using a One Health paradigm can help chart a path toward improved sustainability at the planetary level.